An important aim of the WISER project is to support the intercalibration process. One of the first steps required by the intercalibration guidance is to derive "common metrics", i.e. biological measures created for benchmarking and comparison of national assessment systems. 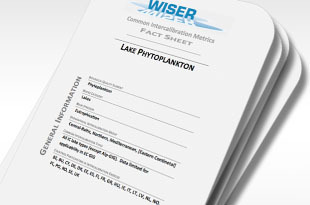 The WISER workpackages addressing individual organism groups (Biological Quality Elements) and ecosystem types (lakes, coastal and transitional waters) develop common metrics according to a common "Guidelines for indicator development" (Deliverable D2.2-2.pdf). All common metrics are documented in a harmonized format. A common metric is a yardstick for comparing national assessment systems and their classification of ecological status. They quantify the structural or functional attributes of biological communities, allowing for an assessment of ecological quality. Common metrics relate to the results of the national assessment methods used in the particular intercalibration exercise and respond to the stressor (or combination of stressors) addressed. Common metrics are not meant as pan-European assessment systems replacing national methods, which are usually much better adapted to the regional situation. Here we present the common metrics developed in WISER. A first version was available in summer/autumn 2010; since then, most of the common metrics have been updated. In addition to the already available metrics CPUE and BPUE new composition metrics are under development. Except chlorophyll (already intercalibrated in the first IC round) no generally applicable metrics was identified. Attempts to develop a common metric have followed two tracks: one using size spectra of the phytoplankton community and one using taxonomical information at the group level for a multi species/group indicator. Size spectra of the phytoplankton community have shown promising relationships with eutrophication. However, the data necessary for this characterisation of phytoplankton is rarely available from monitoring programmes. Phytoplankton community composition based on pigment data obtained from the WISER field sampling was analysed for correlations with total N and total P as measures of eutrophication. Phytoplankton communities were significantly different between sampling sites but the main structuring factors were salinity and temperature with only minor correlations with nutrients. A commom metric for Med GIG-angiosperms is finalized, which is used in the respective intercalibration exercise. In case of NEA GIG common metrics for macroalgae and angiosperms (salt marsh plants and seagrasses) are in an advanced stage. It will be uploaded mid April. Baltic GIG (including Norway) is working on a common metric for angiosperms (eelgrass depth limit) and on a commom metric for macroalgae (total macroalgal cover), and Med GIG is in a similar stage for macroalgae. For marine benthic invertebrates, WISER has not developed common metrics 'stricto sensu', since the Geographical Intercalibration Groups decided for other options of intercalibration. However, the national multimetric methods were compared to each other using a pseudo common metric. For fish in transitional waters, WISER has not developed common metrics 'stricto sensu', since the Geographical Intercalibration Groups decided for other options of intercalibration. However, the national methods were compared to each other using a pseudo common metric which is documented here.